Oil trains would slow down through major cities, railroads "would increase track inspections and bolster emergency response planning along routes that carry trains hauling up to 3 million gallons of oil each," AP reports. "Those trains travel thousands of miles from oil producing areas, including the Northern Plains, to coastal refineries." AP notes that the agreement does not apply to ethanol, which has "also seen a spate of accidents as production has increased," or "a design flaw in tens of thousands of tank cars that make them prone to rupture during derailments." Railroads said that would be addressed in a separate agreement. 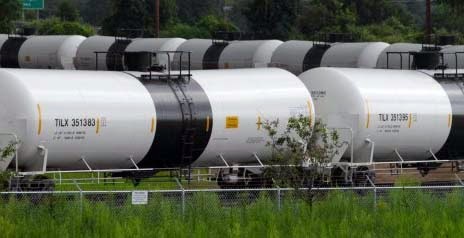 The voluntary agreement will allow railroads to act soon instead of waiting "for new safety rules to be drafted and approved by the government, said Robert Chipkevich, former director of rail and hazardous materials accident investigations at the National Transportation Safety Board. But he added that there's no way for now to enforce the industry's commitments," AP reports. While there are fears that physicians can't handle the influx of patients newly insured through federal health reform, especially in rural areas, Medicare and the state of Arkansas may have found a way to accommodate those in need of services. David Pittman of MedPage Today reports the news from El Dorado, Ark., just north of the Louisiana border, where SAMA Health Care Services has become a beacon of success while embracing Obamacare. The four-physician, primary-care practice, with the help of funds from a Medicare program, "has worked to add more staff and organize care teams to be able to see more patients, increase worker and patient satisfaction, and hopefully generate more revenue for the practice," Pittman writes. "Until a couple of years ago, the practice was a group of physicians and nurses working mostly independently of each other—although all under the same roof. One physician would rotate to be on call that day to take same-day appointments, but patients would complain that they wanted to see 'their doctor.'" SAMA is one of 69 Arkansas primary-care practices "participating in a Medicare PCMH demonstration project called the Comprehensive Primary Care Initiative," Pittman reports. "Practices in the program receive a per-member-per-month bonus from Medicare, Arkansas Medicaid, Arkansas Blue Cross and Blue Shield, Humana, and QualChoice of Arkansas to better coordinate care for patients with those insurance plans. Providers also receive bonuses if they hit certain quality measures." To make things easier for employees and patients, "Staff members reorganized themselves into four teams, each with a physician, an advanced-practice nurse, care coordinator and three other nurses. The teams even wear different-colored garb—purple, orange, blue, or red—to let patients know which team is caring for them," Pittman writes. "Under this structure, each team is responsible for a set of patients, whether they are same-day visits or routine check-ups. They have a system where patients just discharged from the hospital will get a phone call within 24 hours and will be seen in the clinic within a week." The facility, which plans to add a fifth team in May, will have doubled its number of providers since August 2013. Hospital administrator Pete Atkinson told Pittman, "Especially with the Affordable Care Act, we're seeing a ton of patients that never had insurance. The better job we do, the more people that want to come. There was no way we could continue to be the same size and provide proactive services." The Environmental Protection Agency proposed new safety rules Thursday to protect people who work in farms, or live near them, and might be exposed to dangerous pesticides, Carey Gilliam reports for Reuters. "EPA is proposing revisions to the agency's 22-year-old Worker Protection Standard that EPA officials say will help protect approximately 2 million U.S. farm workers and their families from exposure to pesticides used to protect crops from weeds, insects, and disease." North Dakota might be the happiest place to live in the U.S. The state topped the Gallup-Healthways Well-Being Index for 2013, displacing Hawaii, which had held the top spot for the past four years. On the other end of the spectrum, folks in West Virginia and Kentucky are living the least happy, healthy and prosperous lives; West Virginia ranked last, hitting the bottom of the list for the fifth straight year. But the numerical differences are not very large. States are scored on a scale of 0 to 100 based on interviews with residents about emotional health, work environment, physical health, healthy behaviors and access to basic necessities, Witters writes. The national average was 66.2, down 66.7 from 2012. North Dakota had a score of 70.4, while West Virginia scored 61.4. North Dakota scored the highest for work environment, 60.7, and physical health, 79.6. Alaska was highest for emotional health, at 82.9. Vermont was first for health behaviors, at 71.7. Massachusetts was first for access to basic necessities, at 86.9. West Virginia was last in every category except work environment, with Mississippi holding that spot. The new Farm Bill has new penalties to discourage cockfighting. Merely attending a cockfight is now a federal crime punishable by up to a year and prison and a $10,000 fine. Bringing a minor to such an event could result in up to three years in prison and a $250,000 fine. attached to a bird's legs before a cockfight. Craig Davis, president of the United Gamefowl Breeders Association, told the Lexington Herald-Leader that the law could make good citizens into criminals. "The grass roots on this are not playing games anymore. They've been beaten and battered for 30 years. They're rural people. They want to be left alone," Davis told the Kentucky newspaper. Though law enforcement officials don't often cite citizens for cockfighting, the Farm Bill makes it a much more serious offense. "I think we're going to get some enforcement," John Goodwin, director of animal-cruelty policy for the Humane Society of the United States, told the paper. "Law-enforcement agents all across the country are really tired of these cockfighting pits because they see the cruelty, but they see these pits as magnets for other crime as well." He recounted a 2008 Drug Enforcement Agency bust in Cumberland County, Tennessee, at a cockfighting ring connected to a Mexican drug cartel, the Herald-Leader reports. Goodwin said said that now all cockfighting pits in Tennessee are at risk for going out of business. "Now, if the feds raid a cockfighting pit, anyone there can pay fines and do prison time," he said. "All the gambling dollars are not going to offset that. They're starting to figure out, 'Hey, there may not be a future in cockfighting.'" Goodwin said they need to accept that at the federal level, no one wants to partner with people doing something that's illegal in every state. 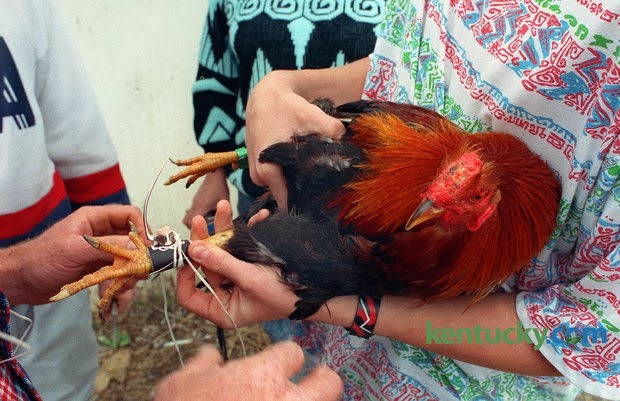 Davis said that breeding gamefowl helps many rural Kentuckians to make money, and he's upset with Senate Minority Leader Mitch McConnell for supporting the bill. "Davis and several hundred cockfighting enthusiasts greeted McConnell, U.S. Sen. Rand Paul and Agriculture Commissioner James Comer in London on Monday as they made a swing through Eastern Kentucky to promote economic development proposals," which include pilot industrial-hemp projects that the bill legalizes, the Herald-Leader's Janet Patton and Sam Youngman report. For a video report from WYMT-TV in Hazard, click here. Rural hospitals in Georgia keep closing, with three shutting their doors last year, one closing this year, and several more, most of them critical access hospitals, in danger of being shut down. With so many hospitals taking it day to day, Sen. David Lucas (D-Macon), whose district includes all or part of five rural counties, including one where the only hospital closed, has come up with a solution, presenting a bill to open small emergency rooms in under-served rural counties, Maggie Lee reports for The Telegraph in Macon. While the number of farms and amount of farmland declined, revenue from agricultural products in the U.S. rose 33 percent from 2007 to 2012, to $394.6 billion, according to a preliminary report of the 2012 Census of Agriculture, taken every five years. Agriculture Secretary Tom Vilsack said that the data provide "a snapshot of a strong rural America that has remained stable during difficult economic times." A full report, along with state and county data, will be released later. "Conducted since 1840, the Census of Agriculture accounts for all U.S. farms and ranches and the people who operate them," says an Agriculture Department release. "The census tells a story of how American agriculture is changing and lays the groundwork for new programs and policies that will invest in rural America; promote innovation and productivity; build the rural economy; and support our next generation of farmers and ranchers." From 2007 to 2012, the average value of a U.S. farm increased from $137,807 to $187,093, the largest rose in the history of the census. However, farmland values have been dropping recently, and experts last week predicted that they could drop 20 to 25 percent over the next few years. Corn Belt farmland value rose 20 percent from 2009 to 2013, leading some to fear a bubble was approaching. The same fear was felt with rising prices in Northern Plains and Great Lakes states. Farmland prices fell from 2012 to 2013 in some areas in the Midwest and Southeast. The census found that 2012 crop sales amounted to $212.4 billion, exceeding sales of livestock ($182.2 billion) for the only second time (1974 was the only other). The department projected Thursday that corn and soybean prices, which were at record or near-record highs in recent years, were would drop significantly this year. The census found that farmers continue to get older, with the average age rising from 57.1 in 2007 to 58.3 in 2012. The U.S. had 2.1 million farms in 2012, down 4.3 percent from 2007, and the amount of farmland dropped from 2007 to 2012 from 922 million acres to 915 million acres. But the percentage drop in farmland acreage was the smallest since 1950. To read the preliminary report, click here. While heroin use and overdoses are on the rise across America, a newer, more powerful synthetic drug called acetyl fentanyl (right) is being branded a killer because of the high rate of overdoses linked to its use. The drug is working its way south, where many rural areas are already facing a heroin epidemic, brought on by officials' striving to stop the prescription drug problem. This opened the door for dealers and users to turn to cheaper, more easily accessible drugs like heroin—and acetyl fentanyl. The dangers of acetyl fentanyl first came to major notice last year when Rhode Island reported 14 deaths from the drug from March 7 to May 26. At the time, there was little information about the drug. "We know that an astonishing number of Rhode Islanders are dying from a mysterious, never-before-seen, man-made drug," Philip Eil reported for The Providence Phoenix. "But we know little else. Who? Where? Why?" The high number of deaths in Rhode Island led the federal Centers for Disease Control and Prevention to release a health warning in June 2013. According to a report by Trust for America's Health "only 17 states and Washington, D.C. have laws in place to provide a degree of immunity from criminal charges or mitigation of sentencing for individuals seeking to help themselves or others experiencing an overdose." Those states are Alaska, California, Colorado, Connecticut, Delaware, Florida, Illinois, Maryland, Massachusetts, New Jersey, New Mexico, New York, North Carolina, Oklahoma, Rhode Island, Vermont and Washington. The highest rate of drug overdose fatalities is in West Virginia, where numbers have quadrupled from 1999 to 2010, with 28.9 out of every 100,000 people dying of a drug overdose, according to the study. New Mexico had the second highest rate, at 23.8 deaths per every 100,000, and Kentucky, where numbers also quadrupled from 1999 to 2010, the rate was 23.6 deaths per every 100,000 people. Other state rates: Nevada, 20.7; Oklahoma, 19.4; Arizona, 17.5; Missouri and Tennessee, 17; Utah, 16.9; Delaware, 16.6; Florida, 16.4; Ohio, 16.1; Rhode Island, 15.5; Pennsylvania, 15.3; Wyoming, 15; South Carolina, 14.6; Indiana, 14.4; Michigan, 13.9; Louisiana, 13.2; Washington, 13.1; District of Columbia, Montana, Oregon, 12.9; Colorado, 12.7; Arkansas, 12.5; Alabama, Idaho, New Hampshire, 11.8; Alaska 11.6; Mississippi and North Carolina, 11.4; Maryland and Massachusetts, 11; Hawaii and Wisconsin, 10.9; Georgia, 10.7; California, 10.6; Maine, 10.4; Connecticut, 10.1; Illinois, 10; New Jersey, 9.8; Vermont, 9.7; 43. Kansas and Texas, 9.6; Iowa, 8.6; New York, 7.8; Minnesota, 7.3; Virginia, 6.8; Nebraska, 6.7; South Dakota, 6.3; North Dakota, 3.4. To read the report click here. Last year Nebraska Gov. Dave Heineman endorsed legislation to allow TransCanda Corp.'s $5.4 billion Keystone XL pipeline to cross part of the state, but now a state court has invalidated the decision, Patrick Rucker and Valerie Volcovici write for Reuters. As a result, the project will be delayed months beyond the expected five years it would already take to build it. Lancaster District Judge Stephanie Stacy said that when legislators allowing Gov. Dave Heineman to decide the route, rather than the Nebraska Public Service Commission, they violated the state constitution. Reuters reports, "TransCanada has been counting on President Barack Obama to approve its pipeline plan, Keystone backers had anticipated the support of states and landowners as well." But many landowners oppose the pipeline on environmental and property-rights grounds. Both Republican and Democratic legislators are pushing Obama to approve it. "The project looms over Obama's economic and environmental legacy," Reuters reports. "In all three cases, the numbers are below what the Congressional Budget Office assumed for crop prices in its own May 2013 baseline used to score the farm bill," Rogers writes. "This further adds to the likelihood that an updated CBO score next month will show billions more in outlays under the revised commodity title." While soybean plantings should increase, "the latest forecast shows reduced corn plantings of 92 million acres in 2014, a drop from 93.5 million acres shows last week," Rogers writes. "And in part this reflects the increased flexibility allowed under the new law, which will allow corn growers to shift more to soybeans and still collect aid promised for their corn base acres under the new Agriculture Risk Coverage, or ARC, program." While the unemployment rate in metro areas and small cities has decreased slightly, the rural unemployment rate continues to inch higher. Data from the Bureau of Labor Statistics show that in December, the rural unemployment rate rose to 7 percent from 6.9 percent in November, while the rate in metrpolitan areas dropped to 6.4 percent from 6.6 percent, reports the Daily Yonder. In urbanized areas with 10,000 to 50,000 people, called "micropolitan," the rate dropped to 6.7 percent from 6.8 percent. "More troubling than the stalled month-to-month unemployment rate, however, is the fact that rural counties and counties with small towns still don’t have the jobs that existed before the recession began in December 2007—more than six years ago," the Yonder reports. One reason for that could be stagnant or declining population; rural population in the U.S. declined last year for the first time in history. The 400-mile-long, 50-mile-wide oil and gas field stretches "from Leon County, Texas, in the northeast to the Mexico border in the southwest," InsideClimate reports. "Since 2008, more than 7,000 oil and gas wells have been sunk into the brittle, sedimentary rock. Another 5,500 have been approved by state regulators, making the Eagle Ford one of the most active drilling sites in America." Three oil and gas facilities "house 25 compressor engines, 10 heater-treaters, six flares, four glycol dehydrators and 65 storage tanks for oil, wastewater and condensate," InsideClimate reports. "Combined, those sites have the state's permission to release 189 tons of volatile organic compounds—a class of toxic chemicals that includes benzene and formaldehyde—into the air each year. Those three facilities also are allowed to release 142 tons of nitrogen oxides, 95 tons of carbon monoxide, 19 tons of sulfur dioxide, 8 tons of particulate matter and 0.31 tons of hydrogen sulfide per year." There are three other facilities, but little is known about "because they don't have to file their emissions data with the state." "Thousands of oil and gas facilities—including six of the nine production sites near the Buehrings' house—are allowed to self-audit their emissions without reporting them to the state. The Texas Commission on Environmental Quality, which regulates most air emissions, doesn't even know some of these facilities exist. An internal agency document acknowledges that the rule allowing this practice "[c]annot be proven to be protective." "Companies that break the law are rarely fined. Of the 284 oil and gas industry-related complaints filed with the TCEQ by Eagle Ford residents between Jan. 1, 2010, and Nov. 19, 2013, only two resulted in fines despite 164 documented violations. The largest was just $14,250. (Pending enforcement actions could lead to six more fines)." "The Texas legislature has cut the TCEQ's budget by a third since the Eagle Ford boom began, from $555 million in 2008 to $372 million in 2014. At the same time, the amount allocated for air monitoring equipment dropped from $1.2 million to $579,000." "The Eagle Ford boom is feeding an ominous trend: A 100 percent statewide increase in unplanned, toxic air releases associated with oil and gas production since 2009. Known as emission events, these releases are usually caused by human error or faulty equipment." Tron said her family wasn't received with open arms when they moved to Vermont, and "It didn’t take long for me to understand why: Vermont draws lots of out-of-staters who move there thinking it’s some sort of promised land of maple syrup and covered bridges," Tron writes. "Vermont is beautiful—the view from our house was breathtaking, with rolling hills stretching for miles, full of grazing deer in the morning and howling coyotes at night. But the state is also more complicated than its reputation. . . . My mother taught GED classes to troubled kids in Queens in the late 1980s. She claimed the problems she witnessed there paled in comparison to what she saw while teaching in rural Vermont," tales of child neglect and sexual abuse. "There were a lot of secrets and a lot of boredom," Tron writes. "Kids would get wasted out on the cow pasture, mostly by drinking and smoking weed. But while some of my peers in high school took opiates like OxyContin, heroin was still frowned upon," Tron writes. That all changed in recent years, especially with the crackdown on prescription-drug abuse. (Read more) A documentary by Green Rivers Pictures details the heroin epidemic in Vermont. To view the video click below or here. Pediatricians in the U.S. far outnumber child psychiatrists, and "Some rural families must drive 100 miles or more for an appointment with a child psychiatrist or neurologist, who often have long waiting lists and accept insurance less often than a family pediatrician," Alan Schwarz reports for The New York Times. One in seven children—and 20 percent of all boys—are diagnosed with attention-deficit hyperactive disorder by the time they turn 18, according to the Centers for Disease Control and Prevention. A 2012 study in the journal Academic Pediatrics found pediatricians and family doctors handle most office visits for children medicated for ADHD, Schwarz writes. According to their professional organizations, there are 8,300 child psychiatrists in the country, but there are 54,000 board-certified general pediatricians. "Yet many practicing pediatricians, family doctors and certified nurse practitioners say they have received little training to prepare for today’s rising number of families asking that their children receive mental-health evaluations." In a similar case of people requesting that family doctors take on more than they might be qualified to handle, Penn State researchers found that rural women were more likely to seek mental health care from their physician, as opposed to a specialist. The non-profit Reach Institute is one group trying to educate medical professionals—through a three-day seminar that teaches how to diagnose and treat ADHD. In addition to the seminar, "Attendees are allowed 12 hour-long conference calls with institute trainers and other trainees over the next six months to discuss real-life cases," Schwarz writes. "A 9-to-5 hotline allows for further consultation with an expert on call." The hemp projects will be run by several of the state's public universities, in accordance with the bill, which allows colleges, universities or "state departments of agriculture to cultivate industrial hemp in agricultural pilot programs in states that already permit the growth and cultivation of industrial hemp," Senate Minority Leader Mitch McConnell (R-Ky.) said in January when he introduced the language to the bill. Comer also announced creation of an "Appalachia Proud" label for marketing products from the region, like the state's "Kentucky Proud" label that has proven successful, and various other measures, including a call to return all coal severance tax revenue to the counties of origin, Bill Estep reports for the Herald-Leader. Comer is planning to run for governor in 2015. Jim Ridgway, an environmental engineer and board chairman for the Alliance for the Great Lakes, said one example of the unnecessary spending is the Corps' proposed tunnel-and-reservoir system, which "is designed to capture floods up to those triggered by a 500-year storm - a tempest so severe it would be expected to happen, as the name implies, maybe only twice every millennium," Egan writes. Since January 2013, one local genetic counselor has counted an additional eight to nine cases of "anencephaly and spina bifida, another birth defect in which the neural tube, which forms the brain and spine, fails to close properly," Aleccia writes. A CDC report released last year examined 27 women in the three counties whose pregnancies had the defect and 108 experiment "control" patients at the same prenatal clinics; they found that 23 cases included anencephaly, a rate of 8.4 per every 10,000 births, well above the national average of 2.1 per every 10,000 births. Twelve cases of anencephaly were reported in the tri-county area in 2012, up from two in 2010 and seven in 2011, Molly Rosbach reports for the Yakima Herald-Republic. A state health department news release stated: “State and local public health investigators found no significant differences between women who had healthy pregnancies and those affected by anencephaly." George Everett, Duke’s director of environmental and legislative affairs, apologized for the spill, and said the company took full responsibility for it, but said he could not answer how much it would cost to clean up the river, but that Duke customers would pay for it, Gutierrez writes. Everett was grilled by "about the direct cause of the ash spill: the collapse of a decades-old storm-water pipe made of corrugated steel." Kansas Gov. Sam Brownback has assigned a committee to determine whether or not deep injection of wastewater from hydraulic fracturing for oil and gas is connected with the recent bout of small earthquakes in a part of Kansas that doesn't often have them, Dion Lefler writes for The Wichita Eagle. "Recent seismic activity in south-central Kansas has raised concerns that fluid injection might be related," Brownback said in a statement. "It's not the fracking itself; it's this re-injection of the fluids into formations that are considered safe to hold it," Don Blakeman, a geophysicist with the National Earthquake Information Center in Golden, Colo., told Lefler. "It's waste disposal." Fracking injects water and chemicals underground, and saltwater comes up along with the gas and oil. The water and used fluids are then pumped underground elsewhere. Rex Buchanan, interim director of the Kansas Geological Survey and an appointee to the governor's panel, told Lefler that if the disposal process is to blame for the quakes, the main problem is likely the more volumnious saltwater. Sometimes reinjection "seems to change the pressure environment on subsurface faults," making them slip, he said. "There's a lot of complex physics going on down there." In two months, Caldwell, which is near the Kansas-Oklahoma state line, experienced three earthquakes ranging in magnitdue from 3.3. to 3.9. "By Kansas standards, that's a good earthquake," Buchanan said. The debate about the potential correlation between fracking and quakes is a hot topic in adjoining Oklahoma, where gas and oil production is even more common. The Sooner State has had some earthquakes in the 5.6 range, and that's quite serious—even for a place like California that gets a lot of quakes, Buchanan told Lefler. "Banks generally don’t like to make small loans, even to credit-worthy borrowers, since they cost about the same to underwrite and service as large loans but don’t generate nearly the revenue," Steve Clark writes for The Brownsville Herald. "Historically, those left out in the cold by the traditional financial sector tend to be worse off financially, partly because they have less money to begin with but also because they end up paying much more for loans through payday lenders." A federal bill that passed the Senate last week and is expected to pass the House could cut down on long drives for rural patients and ease concerns for understaffed rural hospitals. The bill creates a one-year enforcement delay on legislation passed in 2009—that was only enforced last year—which required a doctor to be present in any department where Medicaid and Medicare patients were receiving outpatient therapeutic services—drug infusions, blood transfusions, outpatient psychiatric services, wound debridement and cardiac and pulmonary rehabilitation services. Some rural health groups are trying to cure students of using any kind of tobacco, whether it's smokeless, electronic cigarettes or traditional cigarettes. And if facts about what tobacco can do to a person's body aren't enough, nurses from Oswego Health are using age progression software to show students exactly what smoking will do their appearance, Debbie Groom reports for the Valley News in northwestern New York.